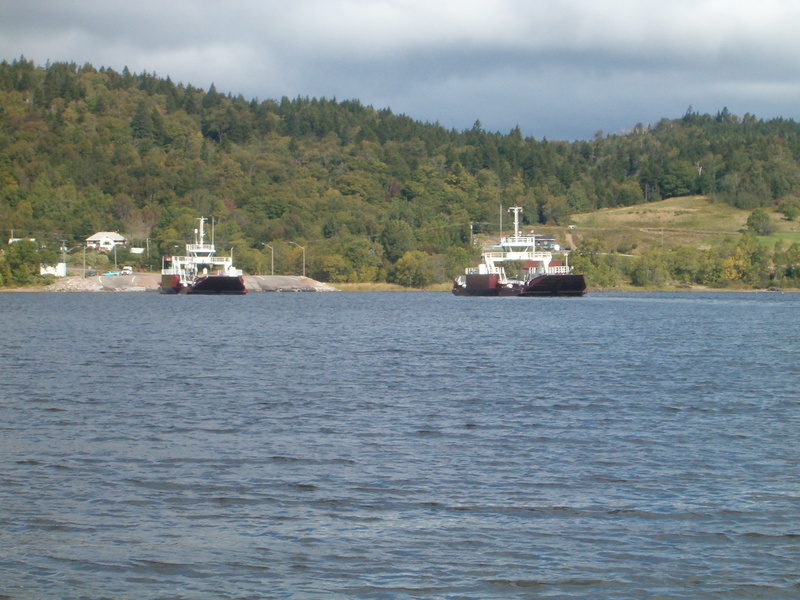 These 3 ferries are sister ships operating on the Saint John River in New Brunswick. All three are double ended cable passenger/car ferries. 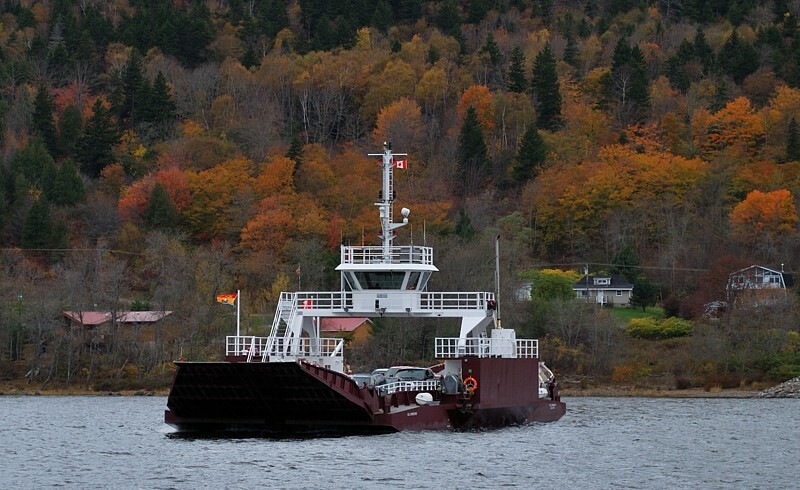 The ferries were designed by EYE for the New Brunswick Department of Transportation and Infrastructure (NBDTI). 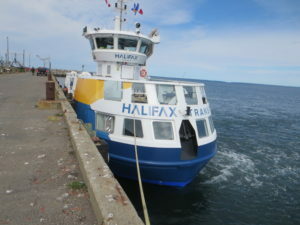 The Henry Nace Ferry provides 24 hour year round service between Westfield and Hardings Point on the Saint John River in New Brunswick. The run is approximately 5 minutes and has a length of 700m. 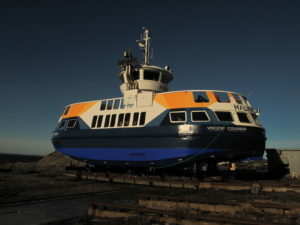 The ferry was built by Chantier Naval Forillon Inc in Quebec and completed in 2009 with EYE providing the onsite representation and technical advisor services for NBDTI. 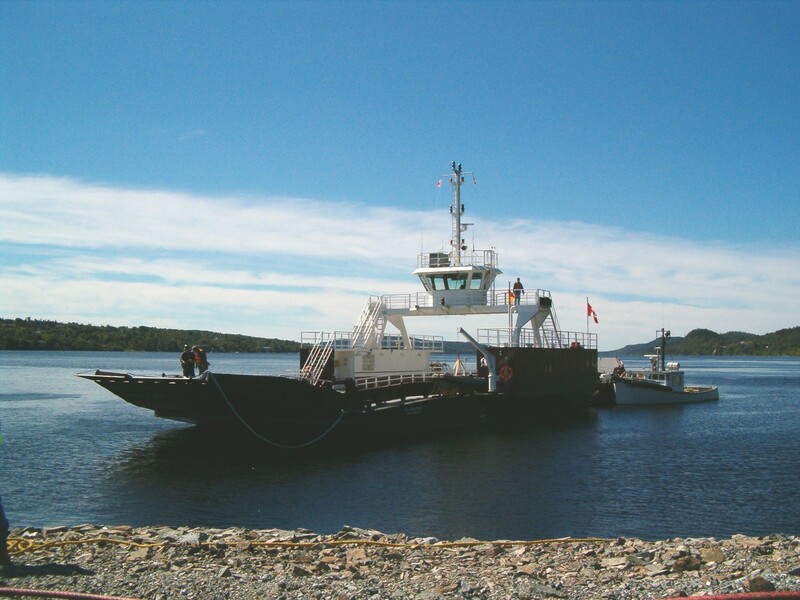 The ferry entered service in 2009 and was registered with Transport Canada at that time. The William Pitt II provides service 16 hours a day year round on the Gondola Point crossing. The crossing is similar to the Westfield crossing at 700m. The Fariweather works side by side with the William Pitt II at the Gondola Point crossing providing 24 hour year round service to approximately 1.5 million passengers annually. 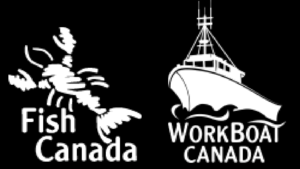 The RGL Fairweather was also built by Fleetway Services in Saint John and entered service in 2004, again with EYE representing the New Brunswick provincial government. The ferry has a main deck engine house on the port side which houses the Caterpillar C12 engine providing both hydraulic pressure to the drive system as well as generating capacity. Engine cooling is done through a closed loop system using a keel cooler on the exterior of the hull to dissipate the heat into the water. The electrical distribution equipment is also housed in the main deck engine house with the batteries below deck in the auxiliary machinery space. The electrical system on board the vessel is comprised of both 120VAC and 24/12VDC. 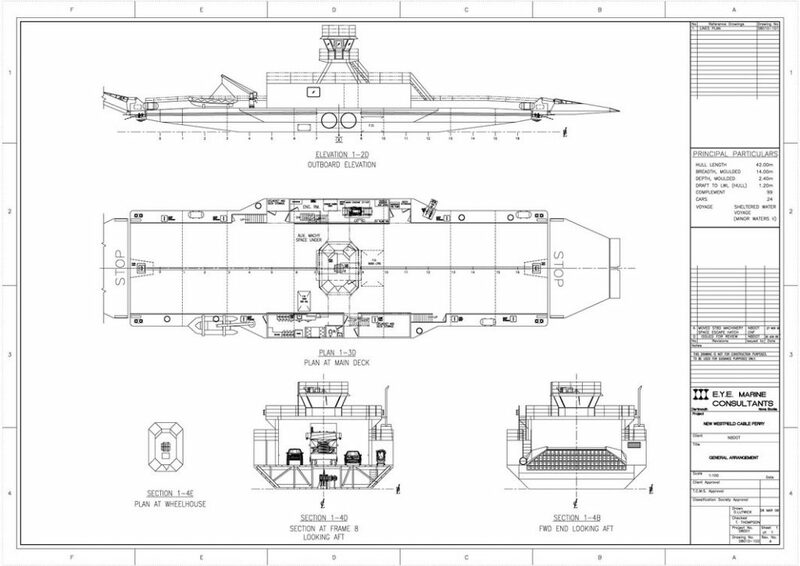 The bullwheel room is located below the main deck in the auxiliary machinery space, it is a watertight room with cable tubes at the fore and aft ends which lead to the end of the ferry and the fairleaders. These tubes are where the 1 1/2″ cable passes through to allow the ferry to drive itself along from shore to shore. The bullwheel seats are designed so that all of the forces developed by pulling the ferry along the cable are neutralized by acting in equal and opposite directions. 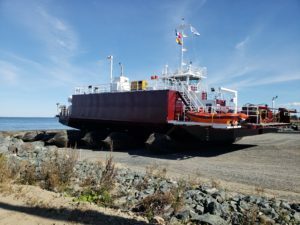 The ferry is outfitted with all the required fire fighting equipment, lifesaving appliances and navigational aids as required by Transport Canada and in accordance with the Canadian Shipping Act. 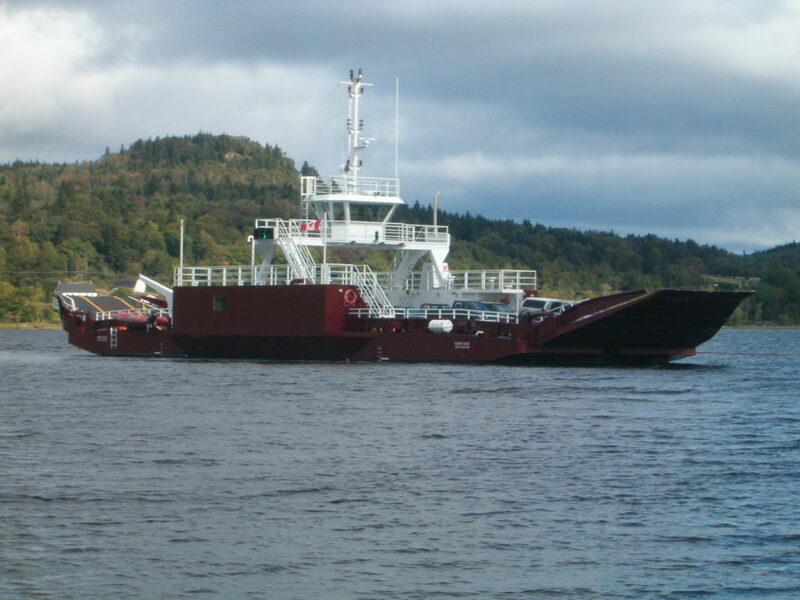 The ferry scantlings were designed in accordance with the ABS Rules for Building and Classing Steel Barges.